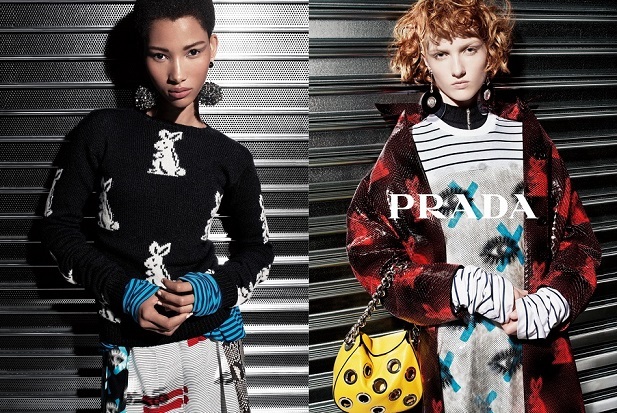 PRADA Resort 2016 Ad Campaign Steven Meisel captures a series of informal portraits, pop decorativism is subverted by industrial minimalism, as his muses lock us in an authoritative gaze. 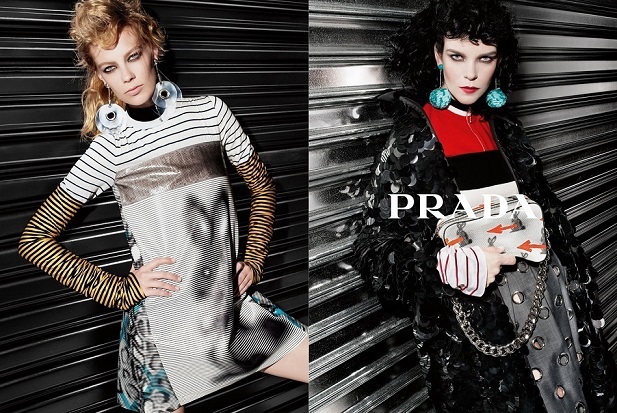 Lexi Boling, Meghan Collison, Ina Jensen, Lineisy Montero, Julia Nobis and Greta Varlese are bad girls turned good, or good girls turned bad, exuding a kind of unhinged innocence. The cool knowingness of their gaze is offset by expressive body language, hands on hips or folded across the body, arms swinging as if in dance. The concept of post-modesty and luxury are investigated in a dialogue of contrasts and dichotomies. High impact pieces, with soft silhouettes, are based on the simple T-shirt. Paillette-covered coats, leather shifts and skin-tight printed sweaters are layered over extra-long striped sleeves. 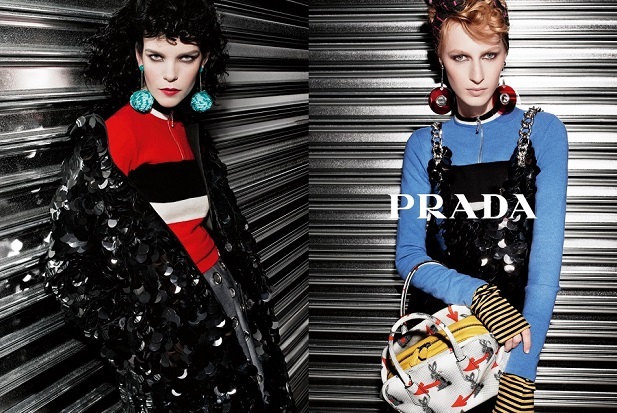 Multi-coloured bags in printed or perforated leathers and bold, oversize earrings are all part of the story. Decorativism, through the serial repetition of symbols recalls the concept of post-pop art. Simplicity becomes uniqueness. An anonymous silver backdrop suggesting a post-industrial landscape jars with this sensual overload, suggesting the collection’s recurring rabbit motif is perhaps not as naive as it seems. Shadow falls across the images, reminding us darkness and light often come entwined. The gaze of the muses is both complex and seductive, warning anyone following them down this particular rabbit hole to expect the unexpected.